The Barn Golf Course sits along the northern reaches of the Wasatch Front in a town called Pleasant View, which is just on the outskirts of Ogden. With the population being just a skosh over 10,000 people, this track has been a Weber County hot spot for years for any golfer within an hour’s drive. People not only come for the good golf but for the staff that owns and operates the course: The Woodland Family. Ever since he was a little boy, Kory Woodland has called The Barn GC his second home – literally, as his home growing up sat just north of the current driving range. Woodland spent many mornings sleeping under the clothes rack in the pro shop as his dad, Kelly Woodland – the course’s head professional – would bring him to work in the morning, often before the sun would even rise. “As far back as my memory serves, I just grew up [and] woke up most days here at the course,” Woodland said. As Woodland grew older, the course became more than just a place to resume his nightly sleep. It was the very spot where his passion for the game of golf came to life. He would often search for lost balls for players who hit errant shots. He’d even accompany Gary Hazelgren, a club professional at the time, during his lessons – acting as if he was just another professional despite being only 11 years old. Developing quite the knack for the game, Woodland’s dad often paired his son with anybody from anywhere – more times than not with players older and better than this future professional. Competing with better talent later helped Woodland make the high school team at Ogden High School, and later the Utah State University men’s golf team. “It kind of interested me that it was a game that it didn’t matter how old or how tall you were, you could go tee it up and really enjoy yourself with just about anyone that would be willing to accept you in the pairing,” Woodland said. Only completing a portion of his college, Woodland knew he was destined to be a golf professional and eventually help take over the family-ran course, just as his dad did from Woodland’s grandparents. Set up as a way to provide some sort of retirement plan for each generation to come along, Woodland’s grandparents sold the course to two of their children, Kelly and Shon, a few years ago, thus enabling them some sort of retirement after purchasing the club out of bankruptcy some 30 years ago. Fulfilling his father’s dream to work with his two sons, Woodland and his brother, Justin, work side-by-side with their dad to help run and operate the 6,131-yard course. Justin Woodland is the superintendent, while Kory helps run the shop – closing five days a week and teaching on Tuesdays. For the Woodland family, golf is what they know. “I think we have the ability to do other things, maybe other talents, but I would just say golf is in our blood,” Woodland said. 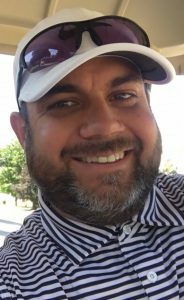 Woodland stated that he has always taken pride in the fact that he is a PGA Professional and a “beacon to the community” – establishing a name that all will recognize and associate with the concepts of integrity and honor. Before returning to The Barn GC in 2002 to be his dad’s assistant, Woodland had the chance to work at a couple other shops around the state: Wolf Creek Golf Course, Oakridge Country Club, and Swan Lakes Golf Course. Due to his family’s efforts and willingness to grind out the long days, The Barn GC has put forth a good quality product despite not necessarily having the highest of revenues around. They have made sure to offer a good price to one and all so every golfer has a place to hit the links and enjoy the game we all love. In an occupation that requires a lot of sacrifice and time away from one’s family, Woodland has fought to give his two children every opportunity to succeed in this life as possible – including a chance to take over the course when the time comes sometime in the future for Woodland and his brother to retire and pass on the family business. But, whatever they choose, the Woodland family is behind them 100 percent. Having somewhat of a creative mind, growing up, Woodland originally wanted to be a course architect like his great-grandfather. After realizing that route wasn’t for him, Woodland pursued his golfing career. However, Woodland never gave up his love for being creative. Outside of his time at the golf course, he enjoys logo and graphic design. (He is the one who designed The Barn GC’s new logo.) He especially enjoys designing golf apparel, and with five or six golf lines of his own, he hopes one day there will be some sort of fruition that comes from his talents. With a self-lived motto of not taking life so seriously, Woodland loves being with his wife, Heather, and their two children. They have had season tickets to the Utah Jazz, and he enjoys any chance to get out fishing. Kory, thank you for your life-long dedication to the game we all love. Many of us keep coming back time and time again because of professionals like you.